The prize closes at 4pm on 29th March 2019. Entries received after this date and time will not be considered. No responsibility will be taken by Lightwater Valley for entries which for technical or other reasons are not entered correctly or are lost. Incomplete entries will not qualify for the competition. Entries from agents, third parties, organised groups or applications automatically generated by computer will not be accepted. The prize is for 4 tickets valid for one visit to Lightwater Valley during the Easter Holidays taking place from 6th - 28th April 2019. The winner will be chosen at random from all qualifying entries. 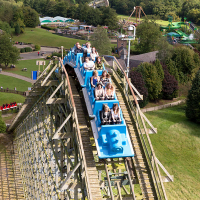 Lightwater Valley's decision is final. Correspondence will not be entered into. The winner must claim the prize by the 5th April 2019. If the winner does not claim the prize by the 5th April 2019, we reserve the right to offer the prize to another entrant or to re-offer the prize in a future draw. Prize is non-refundable and there are no cash alternatives. Lightwater Valley reserves the right to substitute a prize of equal or greater value at any time. The prize draw is subject to the laws of England Wales and Ireland.